These cute novelties are a simple fundraiser at any event. They can also be used as a novel and effective way of promoting your church, school or charity. A triangular shaped shell made of flour, sugar, butter, vanilla and milk. 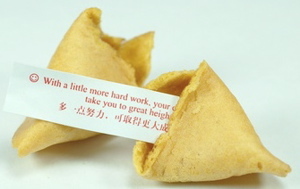 Inside each crisp cookie is a small slip of paper with "The Fortune". The fortune is usually either a straight prediction, words of wisdom or a proverb. Increasingly companies are using them for promotions, the cookies containing marketing messages or advertisments. This option is also open of course to non profit organisations. Increasingly charities, school PTAs and church fundraising groups are using them as a novel fundraising idea, or way of promoting themselves. How do I make fortune cookies? There are loads of companies who will make them for you. A Google search will easily find them. They are not too expensive and you can buy surprisingly small quantities. They also come individually wrapped. The messages inside can be general or personalised for your organisation or event. This is a very competitive market so shop around and haggle. Don't forget to ask for charity rates etc. These funny little cookies make a novel fundraising idea at any event. To learn what the future holds?" You could also schedule your fortune cookies fundraiser for Chinese New Year. Why not sell cookies to your workmates or colleagues. Add to the fun by dressing in oriental garb and offering the cookies on a nice platter. You could also use them as novelty tickets for a tombola. People buy a cookie instead of a ticket. A certain number of "winners" contain a message that entitles you to a prize.
" Congratulations - You've won a prize"
As with all tombolas you need to work out the correct ration of winners to losers you need. And..... you get to eat the cookie! 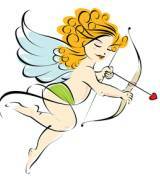 Valentines Day is a perfect occasion to sell romantic Valentines Specials. The messages could be general things about love and romance. Or perhaps it will contain the initials of your secret sweetheart. Who could resist finding out? These work particularly well if you have something special to promote. Simply include the details on The Paper. In particular they work really well promoting new web-sites. Simply include the URL and an incentive for clicking on a particular page. Lucky numbers that need to be checked against those on a web-page are a great way to launch your new web-site or collect email addresses for future send outs. So if you are after a novel fundraising idea or promotion that will get you noticed give these oriental wonders a try. Who knows what the future may hold!